Thanks to the efforts of Georgian Bay Forever, the International Joint Commission expanded the scope of the Upper Great Lakes Study Board, its scientific body, to seriously examine the issue beginning with whether the dredging and erosion in the St. Clair River was responsible for the water level drop, and concluding with what if anything should be done about it. The board’s final report was released in March 2012. It acknowledged the loss of some 21 inches or 53 cm due to the 1960’s dredging and historic mining dating back to the 1850's, but ruled out mitigation before going on to say that climate change represented a bigger, more present threat. 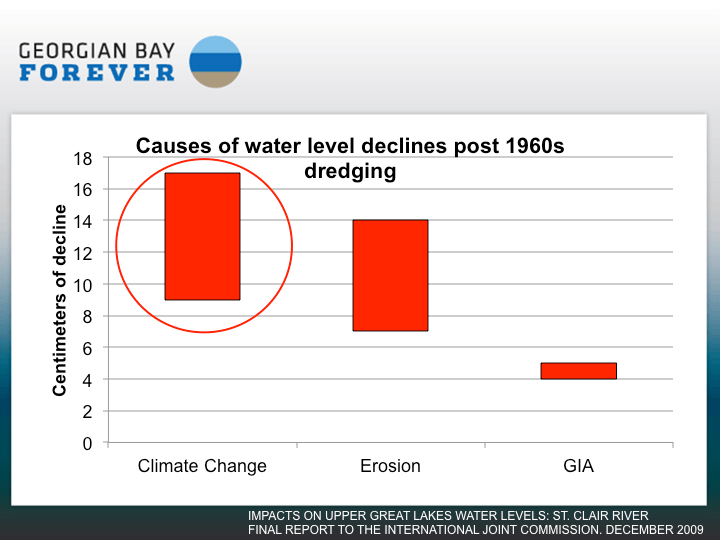 GBF: The St. Clair River was not the major cause of recent lows. When Lake Huron water levels hit their all-time low in 2012 and early 2013, the average outflow in the St. Clair River was 12 per cent below its long-term average*. The water levels were being affected by changes to the climate. This is due to a number of factors especially reduced supply and increased evaporation due to warmer water temperatures and less ice cover. This resulted in a 5.8% increase in the riverine conveyance or the capacity of the river to transport water. This does not mean that 6% more water is flowing out each day but only that the River can convey more water when water levels are higher. Glacial Isostatic Adjustment is a minor contributor contributing about 4-5 cm (2 inches) over the past 40 years. This is due to the earth’s crust rising following the melting of the glaciers. While water levels are likely to decline further, it’s remotely possible, according to the authors, that water levels might also rise. So given the unpredictability of this complex water system, they confined themselves to recommending modest changes to the regulatory plan for the St. Mary’s River. The follow-up IJC Advice to Government recommended that governments undertake remedial action in the St. Clair River to address historic impacts of dredging. Dissenting US Section Chair Lana Pollack stated that this held "false promise" to those expecting real benefits to Lake Michigan-Huron. In the face of expected climate change impacts, this leaves Georgian Bay high and dry. Georgian Bay Forever will continue to press Governments to examine the true economic and ecological impacts of declining water levels and to undertake a serious engineering investigation into an integrated system approach to this problem that would bank water in times of surplus to compensate for times of drought and that would shave off the highs and lows from the extreme swings in water levels that climate change might deliver. Georgian Bay, which has been described as the most complex fresh water ecosystem in the world, absolutely needs more water, and according to the Study Board, Lake Superior cannot provide it given its own “dry” scenarios. An integrated system wide approach offers the only possibility that Georgian Bay ecosystems might be around for our kids’ kids’ kids. •	1948 to 2006 outflow was 189 thousand cubic feet per second.